NTI’s Michelle Price and Sharon Smith greet trauma surgeons at the NTRR booth in San Diego. 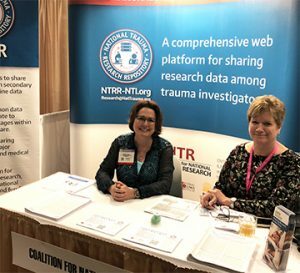 AAST members had the opportunity to see the National Trauma Research Repository at the Coalition for National Trauma Research booth during the 77thClinical Congress last month in San Diego. Many surgeons stopping by the booth had questions about how the NTRR differs from the National Trauma Data Bank (NTDB). Staff members explained that data in the NTDB are de-identified information pulled from trauma medical records—it is not data collected in the course of research studies. There are many variables collected by researchers while conducting studies that are not included in the medical records or the NTDB. The NTRR will include all variables related to studies. Additionally, the NTRR will include multidisciplinary research studies within trauma that are related to orthopedics, neurotrauma, pediatrics, geriatrics, burns, and other disciplines. Aside from accepting data from current researchers, NTI is working on uploading data definitions and data sets from large multi-institution trauma studies completed in the recent past. For more information, visit NTRR-NTI.org.